The seemingly endless slaughter in the Syrian Civil War (2013-present) appears to be readying for the big finale. Forces loyal to the embattled Syrian strongman, Bashar al-Assad, as well as forces belonging to both Iran and Russia, are currently encircling the ancient city of Idlib. It is here that most intelligence services from around the world believe as many as 70,000 “rebels” have amassed (with at least 10,000 being jihadist fighters swearing fealty to al Qaeda). They are hiding among a civilian population of 3 million people–a million of which are children. At present, Syrian Arab Army, Russian, and Iranian forces are preparing to cut the large city off from the rest of the world and pummel it in the mother of all battles. For its part, the United States is utterly incapable of intervening. Even if it wanted to, U.S. forces operating in Syria are nowhere near Idlib. Besides, unlike past instances of American intervention in Syria, the foreign forces defending the Assad regime–notably the Russians–will likely more willing than previously to risk a direct confrontation with American forces. After all, a successful battle for Idlib (no matter how bloody) would end Russia’s costly intervention in the Syrian Civil War, and secure a long-time Russian client, Bashar al-Assad. The stakes for the Americans are incredibly low whereas Moscow has placed a much higher degree of importance to its effort in Syria. And, whoever wants something more than their competitor ultimately wins. Regardless of how many in the Washington foreign policy establishment may feel about Syria, neither President Trump nor the American people want Syria as badly as the Russian-led pro-Assad coalition does. When American forces started slowly deploying into Syria, their numbers were relatively small (compared to past American interventions in the region) and their mission was specifically counterterrorism: U.S. forces in Syria were to hunt down and destroy the Islamic State of Iraq and Al Sham (ISIS). Therefore, most of the American forces are operating in the southeast of Syria out of Al-Tanf, whereas Idlib is located in the far north of the country. Image courtesy of the Institute for the Study of War and Vox. Image courtesy of Voice of America. Al-Tanf is where U.S.-led coalition efforts have been directed out of for the fight against ISIS in Syria. Such statements do not solidify America’s image as being the world’s most dominant military power. While the United States military most certainly is the world’s most dominant military force (on paper), limitations still apply to what that force can and cannot do–especially in the toxic geopolitical environment of the Middle East. Given how few U.S. forces there are in Syria; how far away from the battle zone they will be, and the risk of a wider war against nuclear-armed Russia–and that any American action taken will be after the Assad alliance decimates whatever terrorist elements remain–an American military intervention in response to an Idlib slaughter would drastically exacerbate the chaos that is about to be loosed in Syria. More importantly, the quixotic American attack would actually undermine rather than strengthen the perception that America is, in fact, the world’s most potent military. Something strange is occurring within the Trump Administration foreign policy decision-making process. Earlier this year, after American special forces brilliantly defended themselves against more than 200 Russian military “contractors” near Deir ez-Zor in Eastern Syria, the president announced that, with the near-total destruction of ISIS in the country, American forces could begin returning home. With the news that the Assad alliance was preparing for a final push into Idlib–and that chemical weapons would most likely be deployed in this horrific fight–Trump is now reversing policy. Yet, little has changed in terms of the underlying political realities in Syria. Rather than being trapped in a civil war between jackbooted, Russian-and-Iranian-backed autocrats and compassionate democrats, the Syrian Civil War is a hydra-like conflict. On one side is the Assad regime–supported by both Russia and Iran–and on the other side is a consortium of various jihadist terror groups, all looking to impose their head-chopping ways upon the country. Because of Assad’s alliance with Russia, Iran, and even Turkey–and due to the lack of reliable American partners on the ground–the United States can do little to influence events in Syria (short of a full-on invasion). Should the United States invade, it would find a country more broken and even less strategically important than it found in neighboring Iraq in 2003. And, the conflict there would go just as badly as America’s misadventure in Iraq ultimately went. In April of 2018, the president wanted his military chiefs to formulate a plan to withdraw all U.S. forces from Syria forthwith. After much bickering, Trump compromised with the military, and decided to leave around 2,000 U.S. military personnel in Syria. The reason for these forces remaining in Syria was, supposedly, out of concern that ISIS and other jihadist terror groups that the United States had pummeled might reconstitute themselves. Of course, the Assad-backed alliance is readying to pummel the remaining bulk of jihadist fighters in Idlib. However, now, the Trump Administration is calling for an increase in hostilities with the Assad alliance–at the very same time that Assad and his partners are actually taking the fight to America’s enemies in the country! It’s an exasperating turn of events that will in no way serve American interests. With the assault on Idlib underway, potentially millions of refugees will come surging out, and destabilizing the surrounding environs. Terrorists, too, will likely escape and head out toward both Europe and southern Syria–where American forces are presently operating. Despite repeated public warnings from Trump, the Assad-Russian-Syrian axis have pushed ahead with their mission in Idlib, meaning that they are willing to risk direct conflict with American forces in order to secure their objective: keeping Assad in power in Syria, and ensuring that Syria remains in their proverbial camp. Rather than agitating war with Russia the way that the political establishment in Washington has been doing for several years, the United States must come to grips with the total failure of its policy in Syria (and the wider Muslim world) that began long before Donald Trump assumed the presidency. It’s time to be realistic. Going to war with Russia–especially over podunk Syria–is not worth the life of a single American G.I. What’s more, with the U.S. having effectively stomped out ISIS, the terrorists in the northern section of the country are about to be pounded by the Russians. Why stand in their way? The sooner this task is accomplished the less suffering there will be for all. What the Trump Administration should be doing instead is working with its regional partners to effectively contain what will be a stream of refugees out of Syria into the surrounding countries. At the same time, with its NATO partners in the Mediterranean, U.S. Naval forces should begin a massive quarantine of the region, to prevent any mass refugee flows from penetrating Europe. After all, Europe is one massive migration wave away from being occupied territory. Will this happen? No. America will risk warring against Russia and Iran for a country like Syria–where there are no serious strategic interests at stake–and ignore the threat of either continued terrorism there or the kind of instability that massive refugee flows will create. 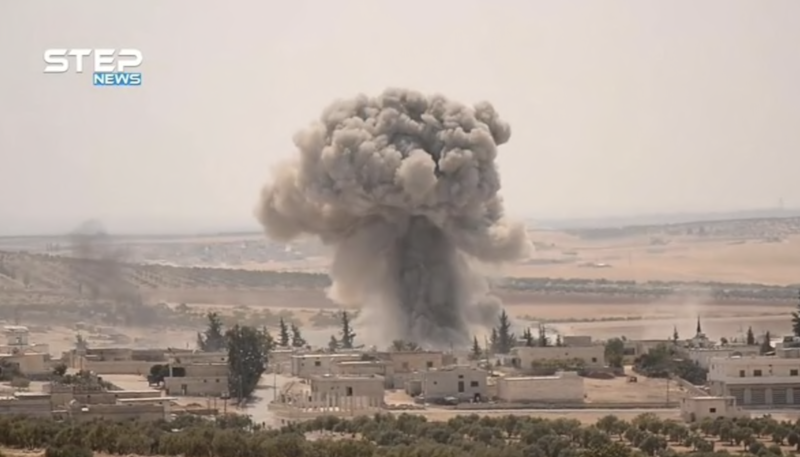 The United States cannot stop the Russians, Iranians, and Assad from taking back Idlib. But, it can help to ensure that the damage caused to Syria does not ripple out beyond its borders. If Trump does what Bolton and the others are warning, then America will look weak and it will become mired in another Iraq War. What’s more, threatening a world war with nuclear-armed Russia over humanitarian interests is a foolish endeavor of the sort usually reserved for navel-gazing academics, like former UN ambassador Samantha Powers, not a freewheeling businessman, like Donald Trump. I hope that Trump’s better instincts play out, but I am prepared to experience another wasteful round of nation-building that leaves America in greater, not less, danger.